It's amazing to think that just two years ago, we all thought mobile was eating Facebook. So, let me try another lede. On May 7, 2012, 11 days before Facebook suffered the biggest tech IPO flop in modern history, the company filed an amendment to its prospectus, on pages 14, 17, and 57, that amounted to a blaring red light for investors. "The trend we saw in the first quarter of DAUs increasing more rapidly than the increase in number of ads delivered has continued. We believe this trend is driven in part by increased usage of Facebook on mobile devices where we have only recently begun showing an immaterial number of sponsored stories." In other words, as Khadeeja Safdar reported in The Atlantic, mobile was eating Facebook. Marking what might be the most significant advertising success story of our time, Facebook is now greedily devouring the mobile-display ad pie, of which it now commands a one-third slice. Today, Facebook reported an all-time high operating margin, and, as if in homage to a certain un-killable quote from The Social Network, its second-quarter earnings are basically one long procession of $1 billion figures. Everything about Facebook is officially Justin Timberlake-approved™ cool. 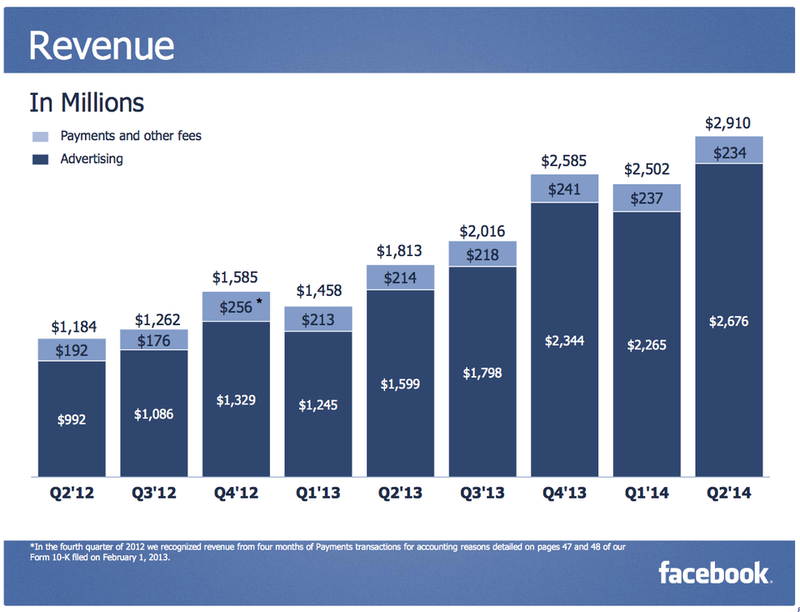 How much more money did Facebook make this quarter compared to 2013? Just above $1 billion. How much revenue is Facebook making a month? $1 billion. How many monthly actives on mobile does Facebook have? Almost exactly 1 billion. And, for frivolity's sake, how many posts and comments about the World Cup did Facebook count? You got it. As Duncan Watts would say, everything is obvious once you know the answer. But man, how obvious does Facebook's success seem today? Mobile might be the future of attention, but buying our attention through banner ads, pop-ups, and pre-roll on a three-inch screen is a rough business. Facebook, however, has essentially solved the visual, contextual, and endogeneity problems of mobile advertising. Everybody in mobile advertising has the same problem: That awful screen. But only Facebook combines (a) the simplicity of a single-column cascading product, (b) explicit information about who we are, what we like, and who we know, (c) controlled experiments that can connect online and offline identities to discover exactly how many people are seeing ads on Facebook and buying that product later, and (d) just ridiculous scale. As Facebook itself has shown, a lot can change in two years. But today, the future of advertising looks like a two-man race.